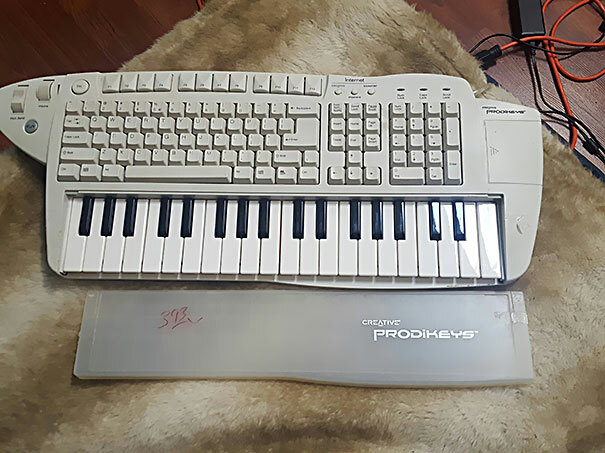 I've just learnt that Creative Labs (of Singapore) used to make Prodikeys: an all-in-one computer keyboard with piano keys! Anyone ever had one of these? Anyone think it would be a good idea? I dare say driver support on a modern computer might not be tip-top.. It has a weird appeal. No thanks. A modern USB version could work with Core MIDI and not require drivers. None of my MIDI keyboards use them except for synths with extended features. I still have one, but I don't think you can get drivers for it any more. I think I used it on Windows XP or earlier -- many years ago. rbratton wrote: I still have one, but I don't think you can get drivers for it any more. I think I used it on Windows XP or earlier -- many years ago. Hard to believe that XP was 14 years ago now. I still have a JL Cooper MiniDesk CS-32, a USB DAW controller with 32 sliders less than the size of a sheet of paper. Officially, drivers were discontinued after Mac OS 10.4 / Win NT. A small community of us were able to hack them to keep it going for a bit longer — me, into 10.6. When I lost the use of my left arm, that was a really nice tool to have. It still works with my G4 Mac but is otherwise useless, dammit. I've not been able to make iPad controllers and the like work as well for me. I sometimes think about trying to find the MIDI version on eBay but don't know if I could make that work through the Mackie protocols. If I stumble into one cheaply enough, I'll give it a go. The box and keyboard are still sitting on my shelf in the computer room. It also came with a SoundBlaster 128 card. Requires Intel Pentium 233 MHz or higher CPU. Ah -- those were the days! Edit: Retail price was $100. Is it possible to edit Speedy keyboard commands?